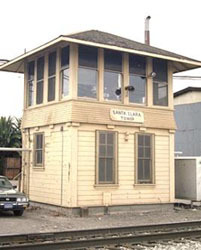 The Santa Clara Interlocking Tower is one of two unmodified Harriman Standard # 4 towers in California and was built in 1926. The tower was not put into operational service until the fall of 1927 due to a last minute management decision to change the local area signals. The signals were changed from General Railway Signal Co. Semaphore type to Union Switch and Signal Co. H-2 Searchlight type signals. On the upper floor of the tower is a General Railway Signal Co. Model 2, unit-lever type electro-mechanical interlocking machine. This machine controlled many switches and signals from the north end of the Santa Clara yard to the junction switches and signals controlling the tracks to and from both San Francisco (Peninsula Line) and Oakland (Mulford Line). The lower half of the tower originally housed the relays and batteries for the tower mechanism. In the late 1960′s, these were moved to adjacent metal sheds and the lower half of the tower became the signal maintainers shop and work area. The tower and its’ interlocking machine were used around the clock until July 17, 1993. 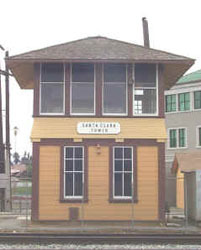 On that date, control of all switches and signals on the Peninsula line was transferred to the Control Center at the San Jose depot. After 65 years of continuous service, the end of an era had come for the tower. Adjacent to the tower are two Maintenance-of-Way “out” buildings that were used by the Southern Pacific Railroad until 1991. The “speeder shed” (circa 1926) once house a motorized track inspectors’ car that was used to check the condition of the rails. The other building is a section tool house built in 1894. The “Company Standard Design” numbers of these buildings have not yet been determined. The SBHRS, in conjunction with the City of Santa Clara, started the renovation of the tower and the two maintenance-of-way structures in 1996. 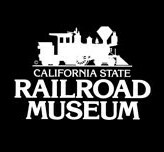 This effort is for the benefit of the local community so that they may be able to appreciate these surviving structures and their contribution to past railroading practices.